Excerpted from A Force So Swift: Mao, Truman, and the Birth of Modern China, 1949. Copyright © 2017 by Kevin Peraino. Published by Crown, an imprint of Crown Publishing Group, a division of Penguin Random House. 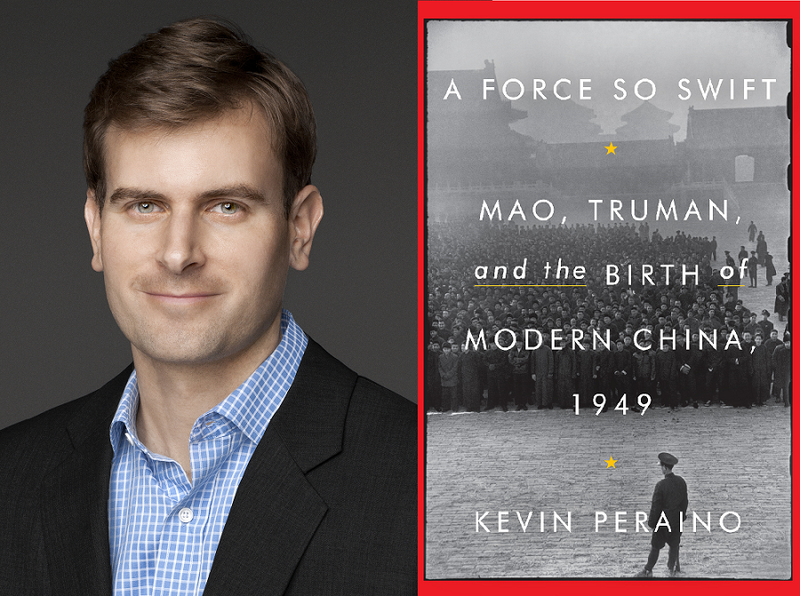 Join ChinaFile, Kevin Peraino, and Richard Bernstein for the launch of Peraino’s A Force So Swift: Mao, Truman, and the Birth of Modern China, 1949, on November 29, 2017 at the Asia Society in New York. Details and tickets are available here. Bodies jostled, elbow to elbow, angling all morning for a spot in the square. Soldiers clomped in the cold—tanned, singing as they marched, steel helmets and bayonets under the October sun. Tanks moved in columns two by two; then howitzers, teams of ponies, gunners shouldering mortars and bazookas. On the flagstones, in front of the imperial gate, men and women craned their necks toward a platform above a portrait of Mao Zedong, painted in hues of blue, hanging beside tubes of blue neon. Underneath, a sprinkling of yellow streamers rippled in the crowd. Nearly everything else in the frenzied square was red. Shortly after three p.m., a tall figure in a dark woolen suit stepped up to a bank of microphones atop the gate. He lifted a sheet of folded paper, pursed his lips, and glanced down at a column of Chinese characters. A double chin rested against his collar; heavy jowls had long since submerged his cheekbones. Although Mao was still only in his mid-50s, he was not in good health. He rarely went to bed before dawn. For years he had punished his body with a masochistic regimen of stewed pork, tobacco, and barbiturates. Occasionally, overcome by a spell of dizziness, he would suddenly stagger—one symptom of the circulatory condition that his doctors called angioneurosis. Still, he had retained into middle age what one acquaintance described as “a kind of solid elemental vitality”—a kinetic magnetism that photographs could never quite manage to convey. On this day, Mao’s speech, delivered in his piping Hunanese, was nothing particularly memorable: a few lines praising the heroes of the revolution and damning the British and American imperialists and their stooges. But the celebration that followed, marking the birth of the People’s Republic of China, was a cathartic spectacle. Mao pressed a button, the signal to raise the flag—yellow stars against a field of crimson—and a band broke into “March of the Volunteers,” the new national anthem, with its surging chorus of “Arise, arise, arise!” An artillery battery erupted in salute; a formation of fighter jets slashed across the sky. The sun set, and the party went on: fireworks raced toward their peaks, rockets of white flame—then fell, smoldering but harmless, into crowds of giddy children. Red gossamer banners billowed in the evening breeze, undulating like enormous jellyfish; to one witness, the British poet William Empson, they possessed a kind of “weird intimate emotive effect.” Lines of paraders hoisted torches topped with flaming rags; others carried lanterns crafted from red paper—some shaped like stars, some like cubes, lit from within by candles or bicycle lamps. Slowly, singing, the glowing procession bled out into the city. Among the marchers was a boy of 16, Chen Yong. He held a small red flickering cube. He had been 12 years old when he joined Mao’s army, though he had looked even younger—a year or two, at least. He had studied Morse code, one of the few jobs for a boy his age, then joined a unit that fought its way through Manchuria. As the long civil war was coming to a close, Chen’s father had thrown his boy back in school. But on this night no one was studying. The war was over; Mao had won. Chen carried his lantern into the dark. Nearly seven decades after this celebratory light show, I visited Chen Yong at his home in Beijing, an unfussy apartment block in one of the city’s western neighborhoods. Chen was now in his early 80s; his hair had gone white, and a gauzy beard descended from his chin. In his hand, trembling slightly, he clutched a pair of eyeglasses. One inflamed eyelid was nearly closed; a furtive intensity had replaced the calm flat gaze of his teenage years. One of my favorite parts of researching this book—a yearlong chronicle of the Truman Administration’s response to Mao’s victory in 1949—was the opportunity to spend time with some of the remaining eyewitnesses to the events of those dramatic 12 months. There are fewer and fewer survivors left; some of the key figures have been dead for four decades and more. The rest are elderly, their memories fading fast. In telling this story I have generally clung to the contemporary documents—the diaries, memoranda, letters, and newspaper reports that yield the most accurate portrait of that year. Still, I never passed up the opportunity to talk with those who were actually there. There was something magical about these encounters—a living connection to a bygone China. In the summer humidity of his apartment, Chen shuffled slowly across the concrete floor, opened a drawer in his bedside table, and pulled out a black and white photo. In the picture, his younger self wore the padded gray tunic of a Chinese Communist soldier—cinched hopefully at the waist, a size or two too big for his teenage frame. As we talked, the emotion of that year seemed as present as it might have been 70 years ago; at one point he quietly began to sing one of his old marching songs. Yet when I pressed him on the granular details of his experiences, he was often at a loss. He would narrow his eyes, looking straight at me, and say with frustration, “It’s hard to remember.” Still, when I asked him how often he thought back to the events of that year, he said, “Pretty much all the time.” And that, of course, is the great paradox of growing old: the less we can remember, the more time we spend remembering. As with people, so with nations: even as the survivors of the revolution are disappearing, Chinese leaders are spending more time trying to recall that era. China’s current president, Xi Jinping, said shortly after he took power that he considered revolutionary history the “best nutrient” for a nation making its ascent as a great power. After years of de-Maoification in the 1980s, China’s leadership now consciously seeks to reprise some of Mao’s best-known political themes. When modern Chinese statesmen look to the past, they gravitate not to the lunacy of the Great Leap Forward, Mao’s reckless attempt to transform China’s agricultural economy, nor to the depredations of the Cultural Revolution, the fevered campaign to solidify Mao’s rule in the late 1960s and early 1970s by mobilizing China’s disaffected youth. Rather, today’s Chinese leaders celebrate the triumphs of 1949, with all their emotional reverberations. Among other tributes, Xi’s government recently inaugurated a new holiday, called Martyrs’ Day, to be held each September 30—the date in 1949 that Chinese leaders broke ground on a major national monument in Beijing. The China of today remains filled with mementos of 1949. On a recent spring morning, I took a day trip from Beijing to Xibaipo, one of the rural base camps that Mao had occupied at the beginning of the year, as his armies prepared to complete their conquest of the mainland. Once a bone-jarring voyage across pitted roads, today it is a painless four-hour drive along superhighways flanked by thick hanging trees. Although the weather in Beijing had been unusually sunny and smog-free, the sky grew hazier as we traveled southwest, into China’s industrial heartland. Out the windows, flashes of the new China whizzed by: sand pits, smokestacks, solar panels, power lines, chewed hills that looked as if they had been eaten by a cosmic-scale monster. And yet in other ways, an older China was with us still. On the dashboard of his Ford sedan, my taxi driver had placed a slick white bust of Mao that said, on its pedestal, safe and sound. In Xibaipo, now a stark but bustling tourist town, we passed a restaurant called Red Memory and an information center selling trinkets emblazoned with portraits of Mao and Xi Jinping. Farther in, we arrived at a complex of low-slung, dun-colored bungalows marked with placards written in Chinese and Russian. Wandering beside the pear and locust trees, visitors paid five yuan to sit in a replica of Mao’s canvas folding chair; for a little more, 20 yuan, they could pose for a photo behind an embankment of sandbags, wearing an old army uniform and hoisting a rifle. The site, according to a member of the staff, had actually been moved slightly from its original location, to make way for a reservoir. But nobody seemed to mind. On this morning the museum was crowded with tourists filing past glass cases filled with relics of the revolution. Yet there is another, darker side to this sort of remembrance. Mao’s victory in 1949 provoked a reaction across the Pacific; by the end of the year, the United States had extended its policy of containing Communism, once limited primarily to Europe, to Asia as well. The Truman Administration crafted an ambitious plan—including a series of covert operations—to bolster the nations along China’s periphery. Even as Mao consolidated his control over the mainland, American operators quietly slipped cash and weapons to his enemies. These historical events, too, inform Chinese views about the present, as the nation continues its fitful rise. Anxious Chinese officials see today’s American policy as a sequel to the containment strategy hatched in 1949. They fret over American troop deployments and training missions to East Asia, and they suspiciously eye flashpoints like Tibet, Xinjiang, and Taiwan for evidence of modern American perfidy. That narrative of 1949—a combination of triumph mixed with grievance—overlooks a great deal. In reality, American policymakers battled fiercely with one another as they struggled to shape a response to Mao’s victory. Some wanted to engage him; others wanted to confront him; still others wanted to ignore him completely. In between existed a thousand shades of nuance. These disputes were not simply tactical differences of opinion; they reflected profound disagreements about the nature of the American relationship with China and revealed fault lines in the American character itself. They destroyed careers, reduced a cabinet member to tears, and in the decades that followed gave rise to some of America’s most divisive foreign wars, in Korea and Vietnam. The most disconcerting thing is that these fissures—though now largely hidden—still exist. Each approach is fueled by its own self-deceptions, its own brand of remembering and forgetting. There is no obvious antidote to all this historical make-believe. It is not a matter of simply setting out the facts; the stories we tell ourselves about China are too freighted with emotion to be chased away so easily. Still, by slipping into the participants’ skins and looking at the dilemmas of 1949 through their eyes, we can begin to share some of their fears and thrills—and ultimately purge some of our own anxieties and misconceptions. In other words, the only cure for a runaway story is another story. This one begins aboard an airplane, with a glamorous woman preparing for a fight.